Grimal, Pierre. L'art des jardins. Talking about the landscape garden, we often stumble upon the debate concerning its cultural origins. Was it in England, in the far East or in Italy? Was it born in the 18th Century, the 16th Century, or even earlier? According to Pierre Grimal, who wrote two crucial essays on garden history, the first examples of what we used to call landscape garden come from the Roman era. In particular from the transposition of Greek landscape paintings into open areas: "This art of landscape garden", he says, "was born thanks to Greek painting, that imposed its aesthetics and even the details of its themes [...] The invention of Roman gardeners was simply to detach the painted landscape and to move it in the open area on the edge of porticos". We could say that the tradition of planting new gardens while studying a particular kind of painting happened in the Roman era just as it occurred in Eighteenth Century England through the study of landscape paintings. And, if you think about it, it's not so hard to understand. Wasn't the Roman landscape itself what Lorrain or Pussin were sketching then? It all makes sense, it seems to be a continuous cycle. And this is just one, for me the most brilliant, of the new perspectives this book offers to those who want to look at garden history objectively. Another key point of the text is found in the quotation that follows: "Landscape is loved, or considered worthy of the artist's interpretation, only as it proves human presence". In 1777 René-Louis de Girardin, in his De la Composition des Paysages, writing about the new way of planting and designing a garden, says that the endeavor ought to be an initiation of sorts that provides a journey for the people who take its path. And it is in this way that he planned his own park in Ermenonville. Man is a complementary facet of the garden. The same idea is true also for the oriental garden, but this is a point we will analyze in subsequent posts. Grimal, Pierre. Les Jardins romains. Paris: Fayard, 1944. Grimal, Pierre. 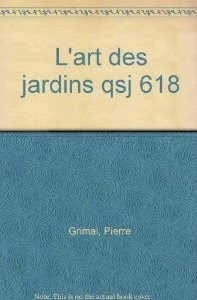 L'art des jardins. Paris: P.U.F., 1954.